Here’s what’s happening in the world of television for Monday, November 27. All times are Eastern. 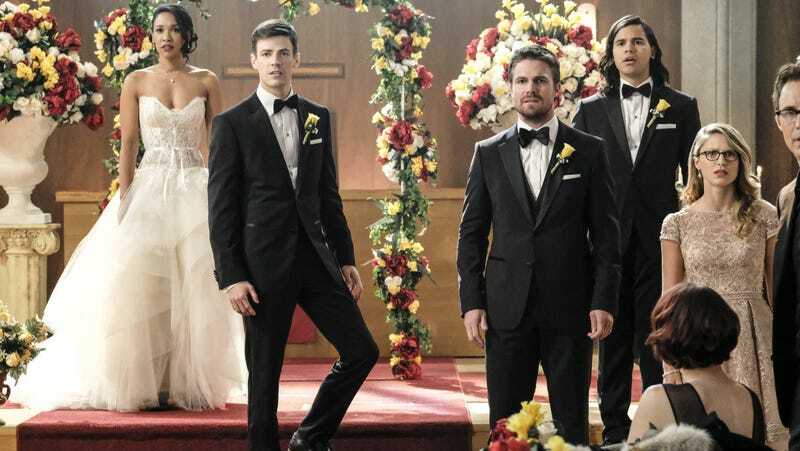 Supergirl (The CW, 8 p.m.) / Arrow (The CW, 9 p.m.), “Crisis On Earth-X, Parts 1 and 2”: The latest DC crossover kicks off tonight on Supergirl, though it’s Barry Allen/The Flash’s nuptials that are interrupted by a new threat—the evil, Earth-X versions of these superheroes. The battle continues in a new episode of Arrow (which airs on special night), before raging into your Tuesday night in episodes of The Flash and DC’s Legends Of Tomorrow. It’s a good thing we’ve assembled our own Justice League of reviewers: Caroline Siede and Allison Shoemaker have you covered tonight, while Scott Von Doviak and Oliver Sava close things out in tomorrow’s two-partner. Godless (Netflix 3 a.m.): Steven Soderbergh’s seven-part drama centers on a town without pity—er, men. Jeff Daniels stars as an outlaw who makes his way into Le Belle, the population of which was cut roughly in half following a mining disaster, in pursuit of his old partner in crime. As mayor of Le Belle, Merritt Wever will have something to say about all these dudes riding into town. Sean Collins hits the dusty trail today with reviews that will post every other day. Fashion Police: The Farewell (E!, 8 p.m.): Attention, Joan Rangers: Fashion Police will take to the red carpet one last time before bowing out for good. The series, which began its E! run in 2010, was never able to recapture the chemistry after Rivers’ death in 2014, and now it’s going out in style.